It’s Official! 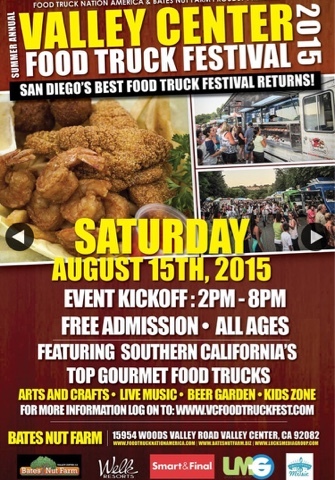 15 Days away til San Diego’s Greatest Food Truck Festival in San Diego County on Sat August 15th, 2015 held at Bates Nut Farm in Valley Center. Featuring 15 of So-Cal Finest Food Trucks including the infamous Food Network Trucks : Devilicious (Season 2) and Ragin Cajun (Season 1) of the Great Food Truck Race and many more.